Dr. Caputi has recently relocated to Ocala from north of Pittsburgh, PA where she was born and raised. 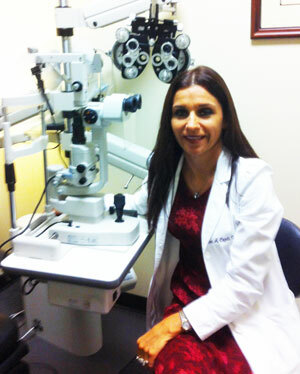 She had previously worked for Lange Eye Care from 2003-2006 and is so excited to be back ! Dr. Caputi has a B.S. In Biology from Clarion University of PA and a B.S. and O.D. from the Pennsylvania College of Optometry in Philadelphia, PA. She is also a former classmate of Dr Lange. She is licensed to practice optometry in Florida, Pennsylvania and Hawaii and has practiced in all 3 states but Florida is her favorite! Dr. Caputi’s professional interests include: primary care, ocular disease, specialty contact lenses, pediatrics and refractive surgery comanagement. She has also had LASIK surgery herself and loves her results!! In her free time, Dr Caputi enjoys spending time with her children, her four cats, reading, weightlifting, working out, going on cruises, traveling and enjoying the outdoors.